Over the past twelve months or so I have written a little about Henry VIII and his reign, and have raised concerns about the accuracy of the accounts we are given in – usually, but not confined to – the big thick history books. The subject often seems book ended to the time between 1509 and 1547. It all too often lacks a backstory. In this, the first of a short series of posts I am suggesting that rather than being compartmentalised history, as the reign is, it should flow. To understand this ‘study of past events, particularly in human affairs’, which began the so-called English Reformation, the prevailing popular perception of the time ought to be challenged. Here, for example, is a quote from Historyextra, the official website for BBC History Magazine and BBC World Histories Magazine. ​“No English monarch has treated those close to him with such ruthlessness as Henry VIII. The older he got, the more he behaved like a petulant, self-obsessed teenager with a loaded revolver. But although he degenerated from a Renaissance prince into a tyrant, casting off wives and servants with merciless finality, he did make England independent. This is a widely available cheap stock assessment of Henry VIII and his reign. ‘Big Henry’ and his six wives, the tyrant king, the brutal despot who ruled with bloodlust, physical passion and belly bursting gluttony. Here is a quote from Sir Geoffrey Elton, Regius Professor of Modern History, Clare College, Cambridge, in 1962. ​“…the Howards yoked him to his second Catherine as surely as Cromwell more openly, forced his second Anne upon him. Whoever wrote the BBC quote made it up - the date, the sad, anachronistic revolver and all. Sir Geoffrey was and remains correct. English history between 1509 and 1547 was determined by people more influential than that man depicted by Holbein as a master of events, policy and fancy codpieces. His wives, all six of them were used as devices by factions to secure royal ratification of the incoming party’s policy for the government of the kingdom. Archbishop of York, Cardinal Thomas Wolsey triggered the sequence of events by using and abusing power invested in him by the Roman Catholic Church. In 596, instructed by Pope Gregory the Great, the papal authority upon which Wolsey relied was brought to the British Isles, from Rome, by Augustine – later Saint Augustine. Almost a thousand years before Cardinal Wolsey’s government of England this missionary cleric came to convert the pagan Anglo- Saxons to the Roman Catholic version of Christianity. Roman rule in Britain ended nearly two hundred years before Augustine arrived. During the intervening period Angles and Saxons from Germany had invaded from the east. They divided native Britons and drove them, some to the north of the island, others to the west. The Anglo -Saxons were, as we know, pagans, however, continuing his mission from the east, Augustine and his band of clerics were successful in converting the Anglo-Germanic tribes to Christianity. As an agent of a powerful Anglo - Saxon king, over the next few years, Augustine continued his way towards the Britons who had been driven west and now occupied Wales, the South West Peninsular and parts of today’s Gloucestershire, Somerset and Hampshire, an area known to history as Dumnonia. There had been a brand of Christianity in Britain, practised by native Britons, for centuries before Augustine arrived. Some may argue that it was introduced during or immediately after Christ’s lifetime, through a vibrant commercial trade between the South West and the Mediterranean. Be that as it may, it certainly was not the brand of the religion that Augustine had come to coerce the natives into following. As Augustine approached the River Severn, his way was blocked, here now lived the Britons. 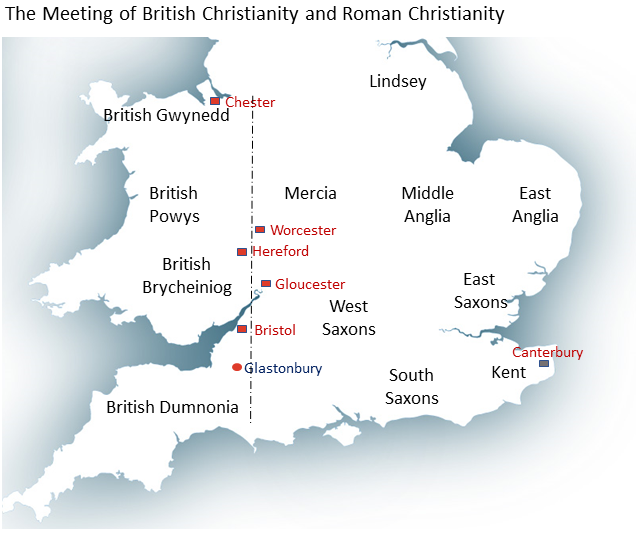 The Britons of Brutus, these were the lands of legend where once King Arthur fought the invading Saxons, the lands of Joseph of Arimathea, the Holy Cross, of Avalon and of Glastonbury. The Britons resisted the influence of the papal autocrats. Augustine however persevered, and a conference – known as Augustine’s Oak was organised, held over two sessions, and probably at separate locations. The conference of Augustin’s Oak, we are told, was convened somewhere on the border which separated the Anglo – Saxons and the Britons, but the Venerable Bede, ‘the father of English history’ unfortunately does not give us the exact place or places. For the first meeting, there are a number of suggestions, Aust on the River Severn is an ongoing favourite, but the most likely is the present day College Green at Bristol. The second was probably held at a location close to Worcester; the proposals are; Rock, Hartlebury, and Alfrick, all in present-day Worcestershire. The Church of St James, the Greater at Stanford Bishop in Herefordshire, boasts the very chair in which, so it is claimed, Augustine sat, and it is lovingly preserved in the chancel. Divisions prevailed throughout the encounters; the date of Easter was at the top of a list of disputes. With that and the tradition in mind, that Joseph of Arimathea, the very man who buried Jesus, had brought the original version of the Christian religion to the West Country the list of differences seemed unreconcilable. The two-sided even refused to eat together. This confrontation, however, was more than about religious doctrine. Augustine was firmly allied to King Æthelberht, the most powerful king in southern England. To the natives, Augustine’s was an alien denomination espoused by the agent of the vanquisher. At the second meeting, the Britons were insulted when Augustine remained seated as they arrived. Discord between the two Christian sides was too great. 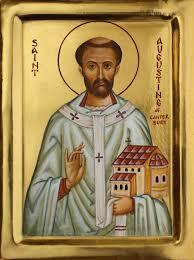 Augustine had converted the Anglo– Saxons, but here he failed with the Britons, and so Roman Catholicism was rejected. In a tale propagated by Queen Elizabeth I’s Archbishop of Canterbury, Mathew Parker, Augustine promised bloody retribution on the defiant natives. His revenge was delivered at the Battle of Chester in 615 when over a thousand monks, Britons from Bangor Iscoed were massacred. Bede’s history includes mention of the monk’s slaughter, led by the Anglo - Saxon King Æthelfrith. "resorted...to pray at the...battle...King Æthelfrith being informed [of this]...said, "If then they cry to their God against us, in truth, though they do not bear arms, yet they fight against us because they oppose us by their prayers." He, therefore, commanded them to be attacked first . About twelve hundred of those that came to pray are said to have been killed". The die was cast – the troubles began, east versus west, the Christianity of the Britons against the Christianity of Rome – and those in between. But in the west from this flux of Britons and Anglo – Saxons was born a hybrid, a defiant breed of people whose evolution was shaped by the border country in which they lived, and it was fostered over the following centuries through necessity, coalescence and intermarriage. “It is 1415 and Henry V is speaking, in Shakespeare’s words, to the Archbishop of Canterbury, Thomas Arundel about the validity of an English invasion of France…"
Roots of the Reformation – Stay Posted!